In the crust of the Earth there are numerous underground holes naturally formed, some of them of large sizes, called caves. The appearance of the caves is the result of the erosion caused by the infiltration of the waters rich in carbon dioxide which dissolved the soluble rocks, especially limestones. These complex systems of galleries, vast and high chambers developed on one or several levels are connected by funnels and pits. In caves, there are often rivers, cascades and lakes as well as mineral formations such as stalactites, stalagmites, columns and curtains that are formed after the precipitation of the calcium carbonate from water. Caves may also appear on the sea shore due to erosion or in volcanic regions during the process of lava solidification. Romania is in a front-ranking place in terms of caves number - more than 12,000. 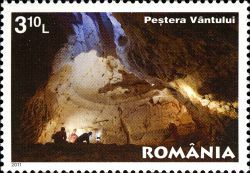 Romanian caves have been known ever since prehistoric times, but their study began in the 17th century. We must mention that Emil Racovita founded in 1920 the world's first Speleological Institute. 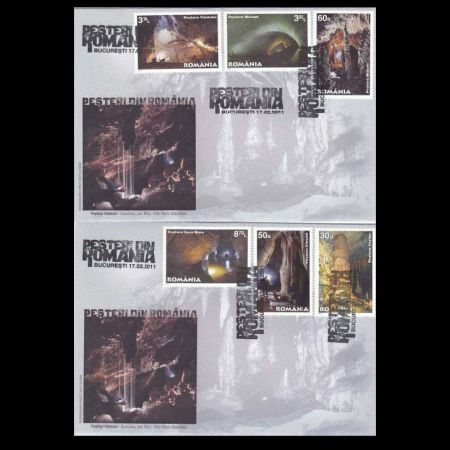 In Romania there are several caves which exceed 10 km in lenght: Vantului (over 50 km), Humpleu (40 km), Topolnita (20 km), Hodobana (about 20 km), Ciur Ponor-Toplita (17 km), Izvorul Tausoarelor (16 km), Polovragi (10 km). 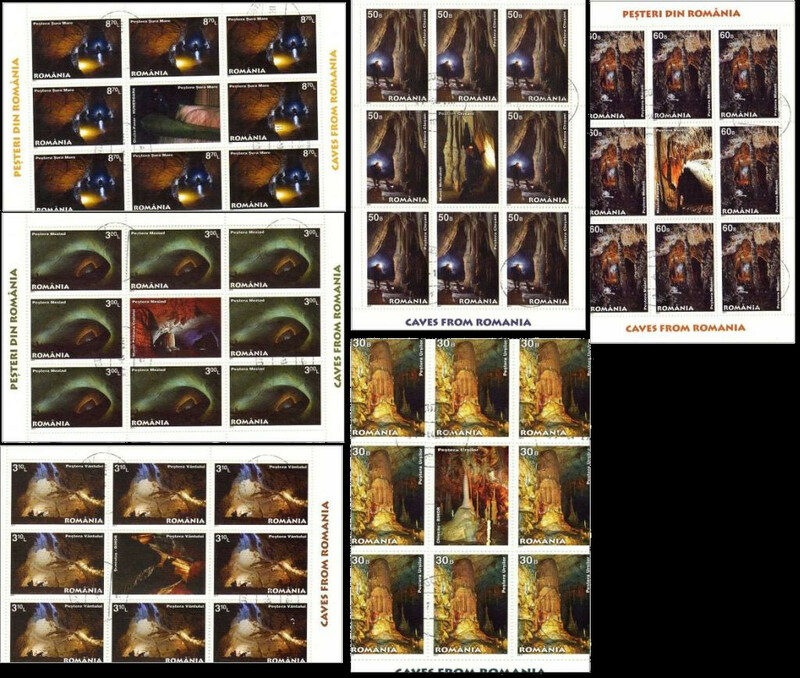 The postage stamps issue "Caves from Romania" that Romfilatelia introduces into circulation illustrates Ursilor, Closani, Muierii, Sura Mare, Vantului and Meziad caves. 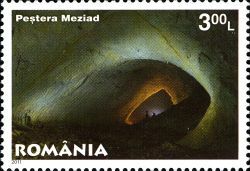 Ursilor Cave, illustrated on the postage stamp with the face value of lei 0.30, is situated in Chiscau, Bihor County, at an altitude of 482 meters and was discovered in 1975. The name of the cave originates from the numerous cave-bear fossils discovered here, being anappropriate shelter for animals for more than 15,000 years. They believe that the cave entrance was blocked by a fallen rock so that more than 140 bears attacked each other because of hunger. 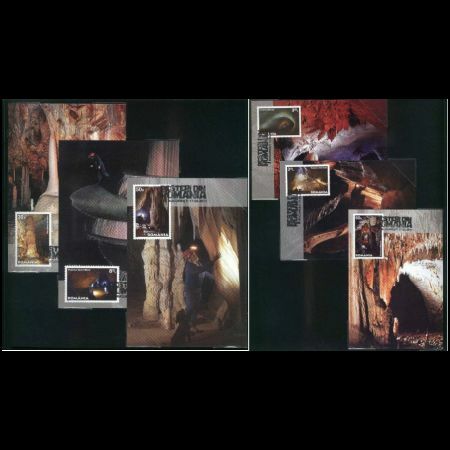 In September 1975, a group of amateur speleologists from "Speodava" Club explored the cave for the first time and 5 years later it was opened for tourists. The cave has three galleries: Bones Gallery, Emil Racovita Gallery, Light Gallery and four chambers: Candles Chamber, Soda-straw Chamber, Emil Racovita Chamber and Bones Chamber. Closani Cave, illustrated on the postage stamp with the face value of lei 0.50, is located in Mehedinti Mountains, at an altitude of 440 m and it is 1,100 m long. It has two galleries: Laboratories Gallery and Matei Ghica Gallery and it is like a real natural museum where one may find various types of speleothemes. Here it is under construction an underground museum of speleology. The cave shelters more than 70 species of terrestrial and aquatic animals, as well as protected bat species. 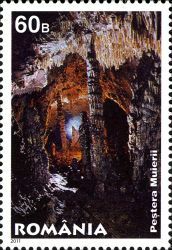 Muierii Cave (Muierilor Cave), illustrated on the postage stamp with the face value of lei 0.60, has been carved in Mesozoic limestones on the Southern edge of Parang Mountain, in the gorges of the Galbenul River from Oltenia. It has countless and beautiful formations highly appreciated by tourists such as Orga Mare, Turcul, Mireasa. 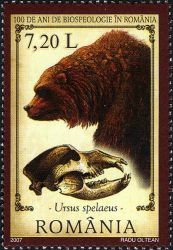 The lower galleries of the cave contain numerous cave-bear fossils and other Quaternary carnivores. Among these bones they have also discovered the mandible of a Neanderthal man dated almost 35,000 years ago. 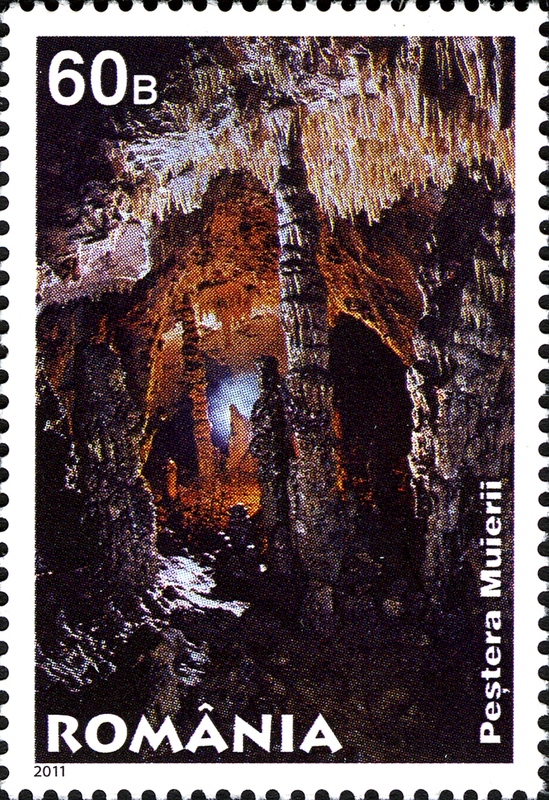 Muierii Cave was the first Romanian cave where they installed the electric lighting in 1957. Meziad Cave, illustrated on the postage stamp with the face value of lei 3.00, is about 5,000 m long. 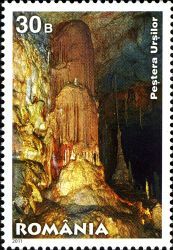 It is located on Meziadului Valley, in Padurea Craiului Mountains, at an altitude of 300 m. The cave has two main levels. When they communicate with each other, huge chambers are formed. 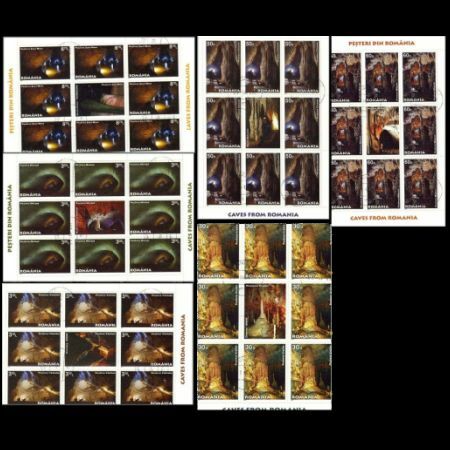 Carnivore fossils were found here as well as human dwelling traces from Paleolithic and Neolithic, attesting that the cave was the shelter for both humans and animals. The cave is also preferred by bats for hibernation. 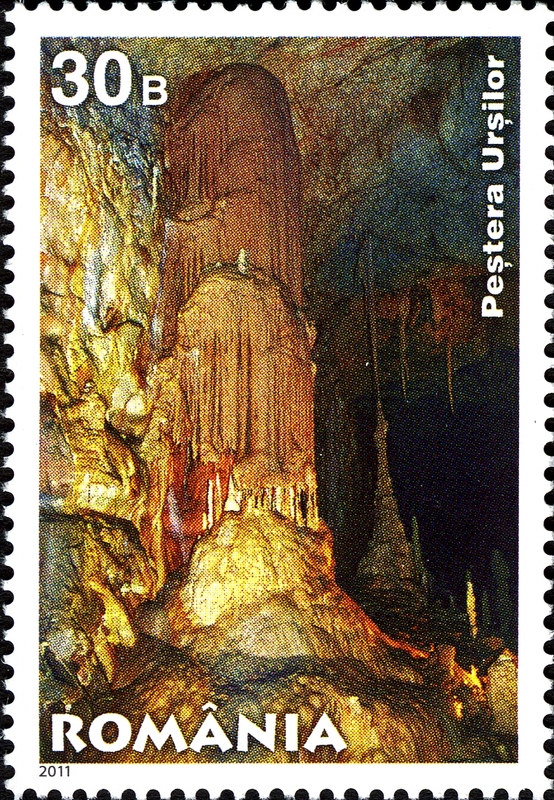 Vantului Cave, illustrated on the postage stamp with the face value of lei 3.10, is situated near Suncuius Commune from Padurea Craiului Mountains (Bihor County). 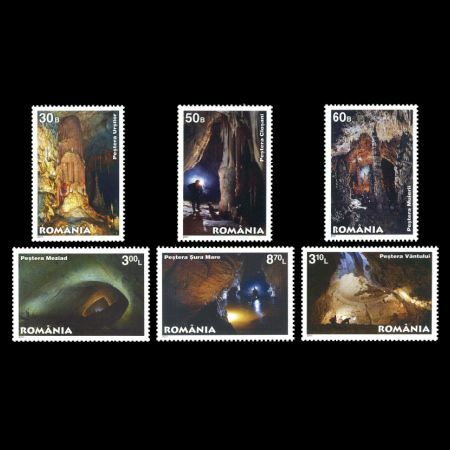 It was discovered in 1957 and it is the longest cave in Romania having more than 50 km of galleries. The underground creek dug in the limestone mountain a maze of narrow and tall galleries. The Great Meander Racovita is highly representative and accessible. The cave also contains remarkable plaster and aragonite formations. 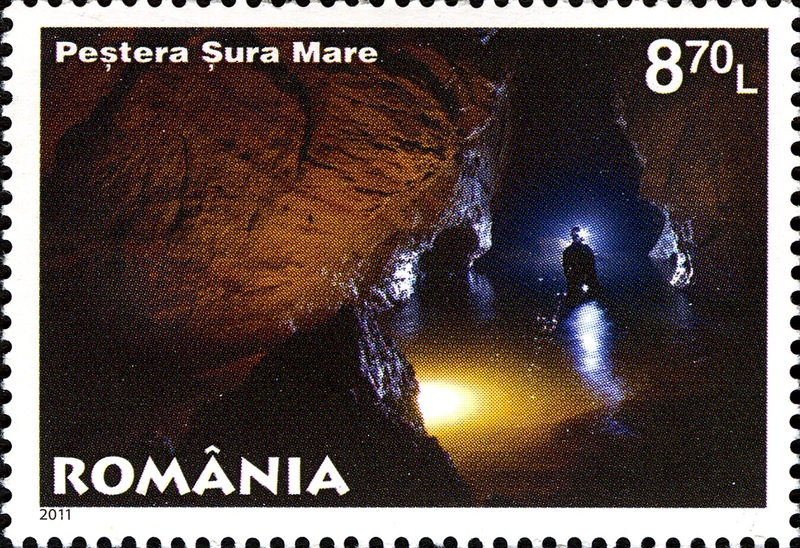 Sura Mare Cave, illustrated on the postage stamp with the face value of lei 8.70, is located on Fruntea Mare Hill, at an altitude of 460 m, near Ohaba-Ponor Commune. The cave entrance is 45 m high and more than 10 m wide. 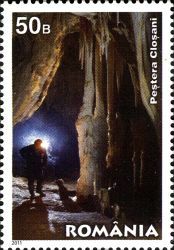 The length of the cave is about 8,000 meters. It is crossed by Ohaba River, supplying numerous waterfalls, whirlpools and a lake. The main gallery with canyon like walls, sometimes exceeds 60 m in height and in two places even wider, forming huge chambers where majestic formations may be seen.Sura Mare Cave shelters the largest bat colony in Europe.